You don’t have to decorate your whole room in an Asian style to use one or two pieces that you like. 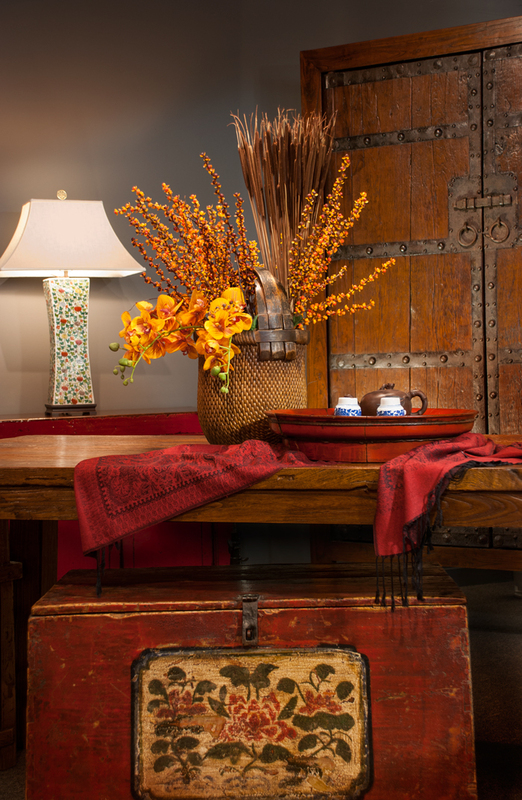 Asian-inspired pieces can be incorporated into almost any decor style. Whether your interior design style is contemporary or traditional or something else, you can add an Asian-inspired focal point to any room. 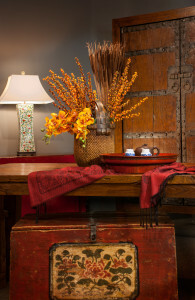 For example, you can use a 120 year old Mongolian trunk (like the one in this picture) as a cocktail table, end table, or simply as a wonderful storage piece for blankets or pillows. The aged market basket is a beautiful accessory with silks and dried flowers as seen here, or, use it for storing kindling by the fireplace or on its own above a cabinet. A lamp isn’t just for lighting a room. It can add drama, color and style. The lamp pictured is made from an aged porcelain “pillow box”. This piece adds a spark of color plus history. Speaking of multiple use, this red “grain bin” shown on the table next to the market basket, would be great to use as a tray on a cocktail ottoman or on a kitchen island with candles or a vase of fresh flowers. These items are available for sale at Elements East in Delafield, WI. If you are looking for your own Asian-inspired focal point, call us today and we can help you find just the right piece to complement your design style.